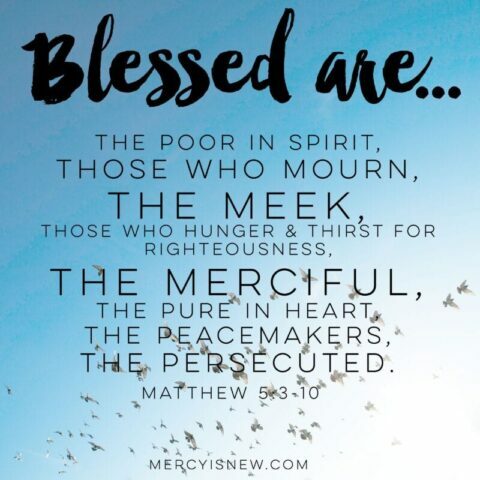 Lord, help our family to truly live out the beatitudes. May we not seek the approval of man, but Your approval. May we remember that the treasures of Your kingdom often look very different from the treasures of this world. May we cling to You and Your Word and not the things of this world. Remind us that the truly blessed are the poor in spirit, those who mourn, the meek, those who hunger and thirst after righteousness, the merciful, the pure in heart, the peacemakers and the persecuted. May we strive to live like You and look more like You with each passing day. When we truly live like the beatitudes are TRUE, our perspectives, our attitudes about others and our assumptions about our own hearts change. We just can’t look the same things anymore when we begin to take on the mind of Christ. How would your life look different today if you began to look at the poor, the pilgrims, those who mourn, the meek…as Christ does?